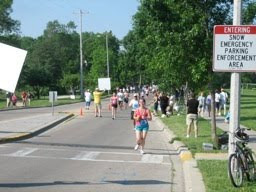 The family and I headed to the Dane County Farmer's Market on Saturday morning and then headed to Alliant Energy Center for the 2010 Madison Marathon Expo. I headed to the full marathon packet pick up. Then the four of us shopped around the expo. It was a decent size for a modest sized race. I stopped by the Bondi Band booth but had self-restraint since we are currently on one income. There were also some exhibitors that I hadn't heard of and saw some cute running skirts. Fuel for pre-race and during race and all my gear. They also sent me a an adorable My Names Race Day Bib HERE. The evening before the race, hubby started feeling sick, but still headed out for a run in the heat. He came home and spent the rest of the night in the bathroom tossing his cookies and slept on the couch. I was wondering if I was going to have to go to the race all alone. I put Little Dude to bed early at 7:30 and he was out by 8:00. Little Diva slept with me and we were out by 8:30. Had a fabulous night's sleep! I woke up at 5:00 am, just before the alarm went off. I felt rested and ready to race! Race day morning around 5:45. Packing up last minute stuff for the kids! We met up with some friends on the Capitol Square around 6:30. She had access to her office and nice, clean bathrooms with no lines!! I went twice and we headed to the start line with 3 mins to go, as the National Anthem was being sung. It was probably good that we didn't get to the start too early, because otherwise my stomach would've been in knots. I felt ready!! We started at 7:00. Here I am at the Finish Line, that I hoped to see again in about 4 1/2 hrs! Some shots of the Start Line some time after the full marathon had started. We ran around the Captiol Square and headed west towards the Arboretum. Some people find it boring, but I really enjoy it. It's so peaceful. Men were darting off left and right into the woods to release their bladders. I had to go at this point, but didn't want to stop to use the restroom. I ended up forgetting about it after 6 miles in and never had to go again the entire race. We headed out of the Arboretum and down Monroe Street (where I saw my best friend), past Camp Randall (UW Badgers Football Stadium) and towards campus. I was approaching a a pace group, that I thought was 4:15. I thought, WOW, slow down ... since I was hoping to finish in 4:20-4:30. Come to find out it was 4:10. YIKES!!! I was either going to do very well, or kill myelf very early. Then we ran up Observatory Drive. Usually, the races in Madison run up Observatory Drive, but in the opposite direction ... and it's hell. So, I thought this would be a piece of cake. WRONG! Running west up Observatory was more gradual and there were more inclines. What a beast! We headed East out of Campus and past the Captirol Loop. I knew my family would be waiting for me around mile 11 ... and they were! I gave my husband, daughter and father-in-law a high five at mile 5 and my hubby said "WOW, you're going to fast" (jokingly!). I was feeling awesome, just behind the 4:10 pacers still. 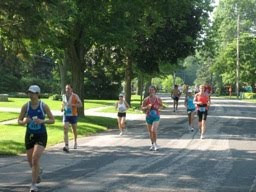 We headed towards Tenney Park and the race officials were announcing the half marathoners go right and full marathoners go left. There weren't many half marathoners with us at this point. At the same time, the guy with the megaphone read my race bib and said "great job, Jamie!" And I screamed with all I had ... and saw Linda (Mom Running From Cancer HERE). The race official said "WOW, SHE's feeling great! Where did that come from?!". I knew Linda would be at Tenney Park, but I was so touched that she was there with her camera taking photos and decorated a sign just for me. I started crying and thanked her. It meant so much!!!! Then I rounded the corner and a bit later, I heard "Great pace, Jamie, keep it up!". Linda was following me on her bike and gave me encouragement for about the next mile. She stopped and took some more photos after we passed the Governor's Mansion. She headed home and off to church and made my day! Maple Bluff is a more mature neighborhood and a bit shaded. The hills were mountainous and killed me. I saw the Girls on the Run Water station at mile 14.5. This hill was killing me! I yelled out the director's name and they all started cheering for me. I finally reached the top of the hill and headed around Maple Bluff Country Club. No more shade here and another huge incline to get to Mile 15 and turn the corner. I started hitting a wall and wanted to walk. I just told myself that I had to get up that hill. I did and went to the water station and then walked through it. The next 5 miles are a bit of a blur. I felt like quitting. The water stations were spaced out approximately every 1 1/2 miles and I just kept telling myself that I needed to get to the next water station and I'd let myself walk for about a minute or so. And, that's what I did. my head. I ran through about a dozen sprinklers, too. I heard ambulances and fire trucks the entire second half. People were laying along side of the road moaning, grabbing their legs, strangers were fanning runners as they laid in the grass. It was a terrible site. As I got to mile 21.5 I saw my father-in-law. He cheered me on and told me that hubby and the kids were at mile 22. I grabbed some water there, as we approached the Madison Monona Terrace and Lake Monona. At the water station they were literally yelling, "STOP RUNNING". (The course was closed at this point, but I didn't know.). We ran around Lake Monona and Monona Bay. I was actually feeling much better at this point, which I would've thought was worse?! They kept telling people to walk and hydrate. I didn't know the clock had stopped. I never saw a mile marker for Mile 24 and was wondering how long this mile was really going to take me. I asked the guy next to me (who had a Garmin) where we were exactly and he said 24.7 .... I said, "Well, that makes me feel much better!!!". I walked throught he last water station as we approached the huge hill up West Washington towards the Capitol. Someone filled my water bottle with ice and it melted immediately. My water bottle sloshed up and down as I dragged myself up that hill. I passed everyone, because they were walking. I saw a neighbor at mile 26 and said "I so needed you here; thank you!!!". She and my daughter's playmates cheered me on. You can read the news article and watch the video describing the heat conditions HERE. The timing system is also having major problems with getting the results posted. Most times weren't posted and most that were posted, were posted incorrectly. Still waiting for my exact time and placement. Although, I'm just really happy I finished ... and within my goal! 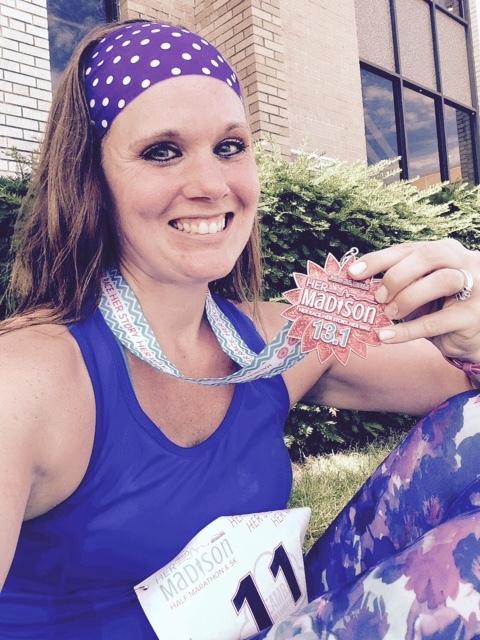 I did it ..... MADISON MARATHON ... beat the heat! Hey ya'll .... I just wanted to drop you a quick like before I clean up from the race today. It's super sunny ant temp is 87 degrees. I was hoping to run 4:20-4:30. I ran just behind the 4:10 pace group for about 15 miles and then hit an early wall. The heat got to me and I walked about 10-12 times during the second half of the race. I am happy I had a good cushion. Marathon officials stopped the clock at 4:00, but didnt' close the course. The results will be "unofficial". They MADE you walk through the water stations after I hit mile 22 and almost everyone was walking anyway. I eventually made it to the finish line in just over 4:27 with a huge smile on my face. 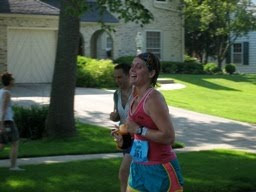 My previous marathon time from Chicago 2008 was 4:37. I can't believe I did it, despite the conditions! Full race report and tons of awesome photos will be posted very soon. Thanks for following my journey!! I was recently given the opportunity to review Cooling Towels from Chill Towels. You can read all about my fabulous experience HERE. Please visit Chill Towels online HERE and start shopping. There were 72 entries in my recent giveaway. One winner was chose at random to receive three Chill Towels. Congratulations, Steel Springs!!! Please email me at jamie dot edge at charter dot net with your name, email and mailing address. And, I will get you your prize! Versatile Blogger Award ... Are you Tagged?? I was tagged by Megan (here), Rio (here), and Stacie (here) with the Versatile Blogger Award. I was asked to list 7 random things about myself and tag 7 bloggers. 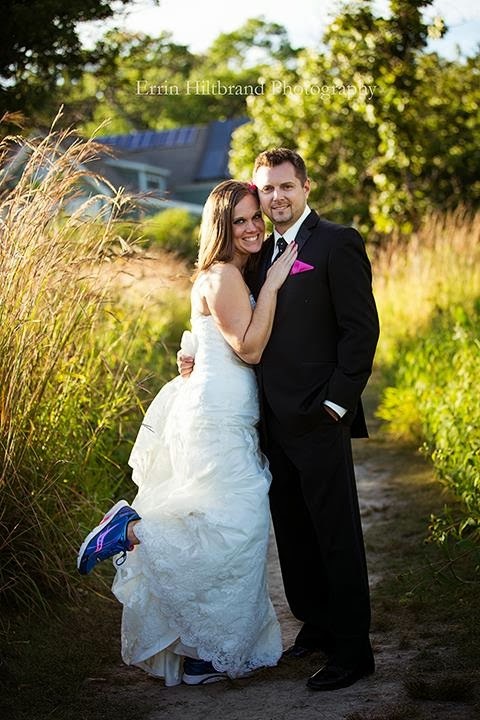 1 - My husband and I have been together since I was 16 yrs old and a junior in high school. We have been together since 1997 ... that's 13 years ... wow! 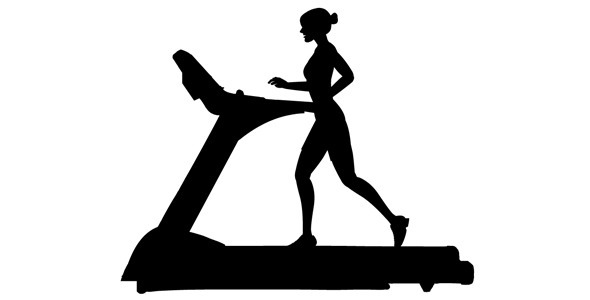 2 - I HATED gym class in high school and my stomach would get in knots every day we had class. I absolutely dreaded indivdiual participation and running the mile at the end of the year. I always finished in the back of the pack with the "smokers". I really laugh at this now. 3 - My only sibling, my sister, is 13 years younger than me and is a junior in high school. And, she looks like my mini-me. 4 - I have visited Walt Disney World 10 times and have gone with my husband and our family the past four years. My husband never went on a real family vacation growing up and I've really enjoyed sharing the experience with him and our children. I chuckle when I tell people we are going there on a vacation and they tell me how much my kids will love it ... until I tell them my six-year-old has been there four times!! 5 - I am addicted to Diet Mountain Dew. I consume about four/day on average. Little Dude always brings me a cold one after my treadmill runs. We keep them in our mini fridge downstairs. Then, I find his toys cooling off in the fridge later on! 6 - I have lived in the same county my entire life. 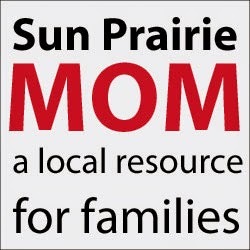 The Madison-area is a great place to raise a family. As much as I hate Wisconsin winters, I do enjoy the change of seasons. 7 - I am obsessed with animal prints. 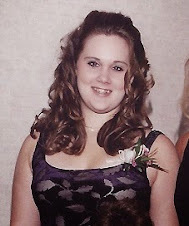 I really don't know where it all started, but it was shortly after high school. Little Diva's nursery was even leopard print (tastefully done, I might add!) with jungle animals and soft yellow and muted leopard print throughout. My two year old was the child in preschool that thought "leopard" was a color!!!!!! So many peeps have received this award and I'm tagging 7 of you to pass it along. 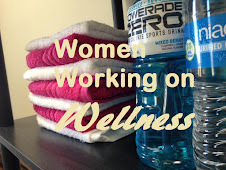 Check out these blogs for some inspiration! Nicole - Who I got to meet at the Disney Princess Half Marathon and is the sweetest thing ever! 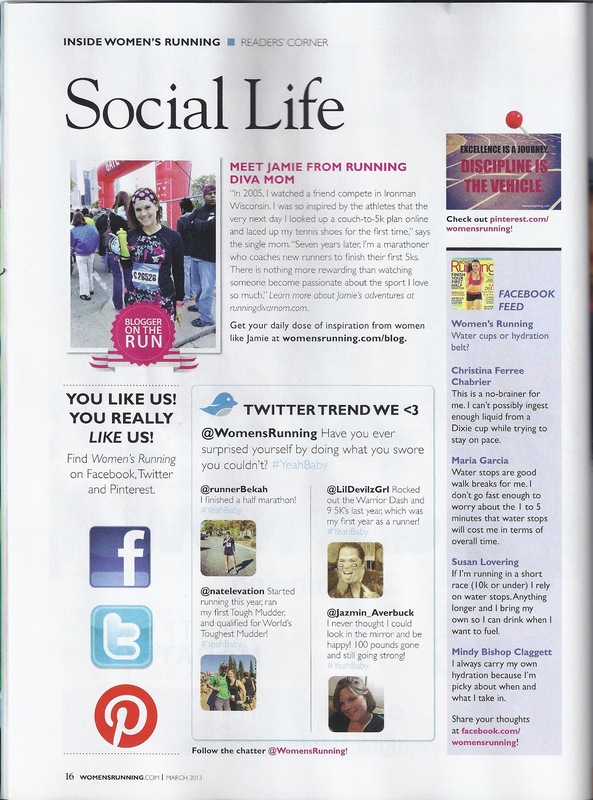 Linda - Who I met at Crazylegs 8K last month and adore! Chelsea - Who I discovered I work right across the street from! That Pink Girl - Who I totally have identified with! Amanda - Who takes the time to comment on almost every post! Laura - Who I met through Etsy and love her creativity! Stephanie - Who's style and personality I love! I was recently given the opportunity to review a personal identification item of my choice from the folks at Road ID. I love that I can head out on a 22 mile training run and tell my hubby that I'll be back in less than four hours and know that if something happens, someone will be able to reach him or my mom. I usually run against traffic, but you still never know what the driver of a vehicle coming head-on is going to do or if they'll see you. Who knows if you'll twist an ankle or get famished by the heat?! With my long training runs this year, I've been able to venture out further than ever before, which has also meant crossing traffic at busy intersections and stop lights. 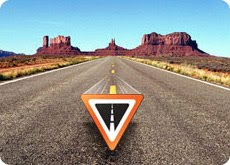 This has been an interesting experience for me, to learn that vehicles don't always fully stop at the intersection ... especially when turning right. You really need to be aware of your surroundings. Anything can happen. 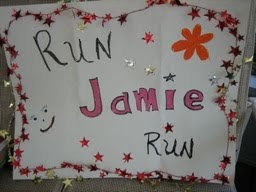 (Yes, my name is Jamie, but this isn't my info!! I already had a black Road ID bracelet, but wanted to add some color and variety to my Road ID wordrobe!! I now have the Wrist Road - Sport - in Pink, too! I find the wrist road ID to be lightweight, comfortable and durable. I wear it on the wrist opposite of my sports watch and it kind of helps "balance me out" when I'm on the road. I had my previous Road ID since 2005 and it still is in excellent shape. It's held up through the blood, sweat and tears I've left on the pavement. The contact information on the ID is still visible and readable after all this time ... amazing. I love how functional these are and you can find one that suits you and your personal preferences. 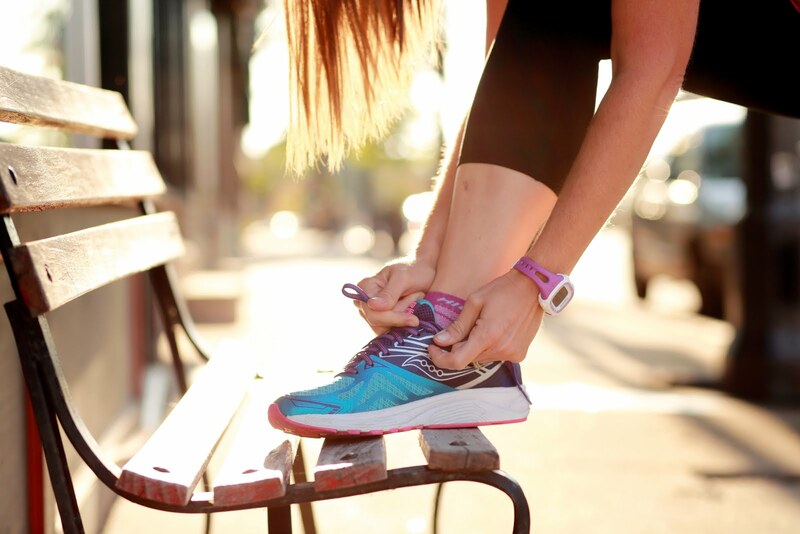 They have wrist ids in various fabrics and styles -- so you can find one that doesn't "bother" you -- I know well all have our pet-peeves with running gear. There also shoe IDs, shoe pouch IDs, FIXX IDs (dog tag), and ankle IDs. I love that you can personalize your ID tag, too! They even have a list of great suggestions and motivational quotes, if you can't come up with something yourself! 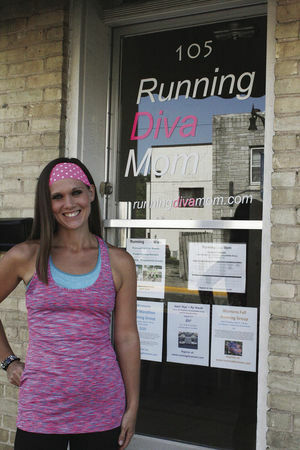 After my emergency contacts, mine says "RUNNING DIVA MOM ... I RUN FOR ME". Love it! One lucky winner will win their OWN PERSONALIZED ROAD ID!! Enter now though Wednesday, June 2. Winner will be announced on Thursday, June 3. 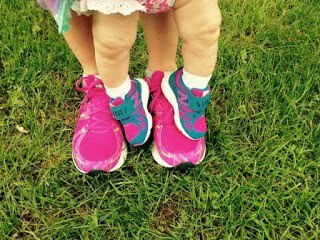 One year ago today, I started this blog and became known as Running Diva Mom. I tried to think of something creative at the time, that represented who I was and I feel that it still holds true. Although, I will be showing up at Sunday's marathon sans-makeup!! Over the past year, I have posted just over 200 times and my ramblings have touched on balancing life, being a mommy, marathon training, potty training, thrift store finds and my weightloss journey over the past 10+ years. 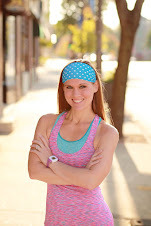 I've also gotten the chance to try out a lot of great running gear, offered a ton of fun giveaways (and LOTS more on the way ...) and have connected with so many bloggers. There are now 326 of you following my journey and others that comment. I'm still amazed that I get so many random emails and inquiries from so many "strangers" out there. People just to encourage me, ask me questions, snag me my race photo proofs or send me a sweet gift in the mail. 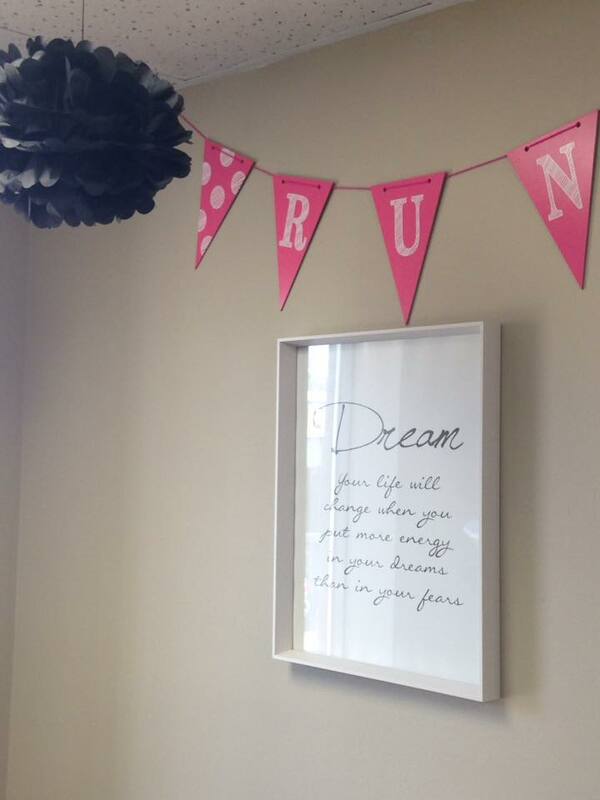 I've connected with Girls on the Run and their "foundress", Molly Barker. So many of you have emailed to notify me that you have now gotten in touch with your local chapter and that makes me so terribly happy! 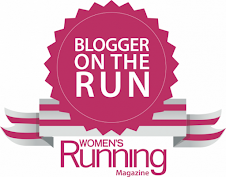 I've met so many great authors and business owners through my blog, that send me interesting news about the running community or ways to get my kids incorporated into our lifestyle. It's been simply awesome and encouraging. and I think I've found it!! While looking online for the perfect pink cupcake , I ran across (pun intended!) this little (or should I say BIG!) number! 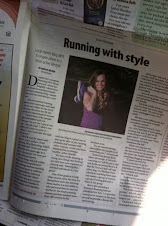 There was an article HERE from Delaware Today about a Girls on the run cupcake competition. There were several fun entries, including this adorable one from Papa's Pastry Shop HERE. If you're near Wilmington, Delaware, stop by Papa's Pastry Shop and taste some of their sweet treats! I think this is phenomenal!! 4 days 'til marathon day!!! Forecast is now 86 degrees ... yikes! If you have a creative side, you'll enjoy this installment of Two for Tuesday. 1 - Laura from Laura Elaine Designs just posted the album that she created for Amanda in my recent scrapbook giveaway. Check out the Disney Marathon Weekend album she made especially for Amanda HERE. And, then go order one of your own!!! I was recently given the opportunity to review Lip Balms from EOS (the Evolution of Smooth). You can read all about my fabulous experience HERE. Please visit EOS online HERE and start shopping. There were 64 entries in my recent giveaway. One winner was chose at random. Congratulations, AJH and Bobbie!!! Please email me at jamie dot edge at charter dot net with your name, email and mailing address. And, I will get you your prize! 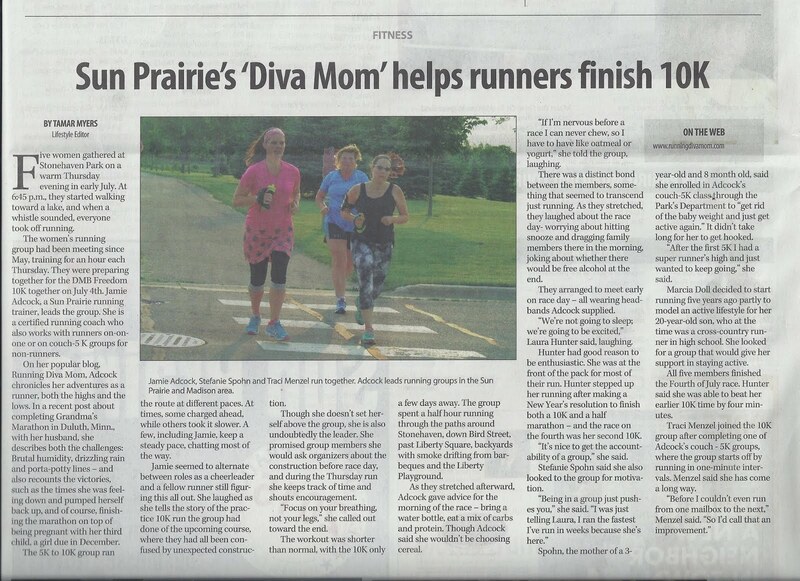 Those of you that follow my journey will recall I announced back in April (HERE) that I would be a hosting a 1 mile virtual race that benefits Girls on the Run. 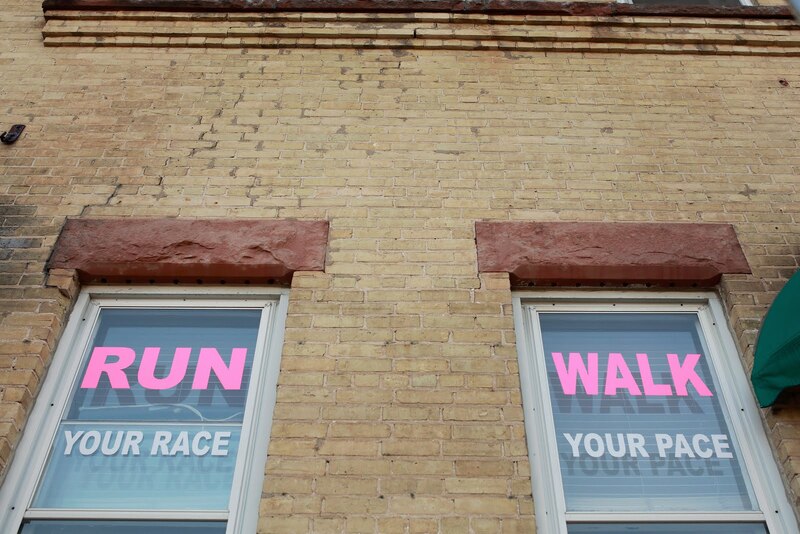 Entry fee was only $1 and would benefit my journey as a Sole Mate for GOTR at the Madison Marathon on May 30th. I really am grateful to everyone the entered and who has supported me along the way. If you haven't already done so, please post/email me your "race report". I have enjoyed everyone's posts and seeing how some of you have gotten your families involved! That makes me so incredibly happy! A link to everyone's race reports and photos ... and the winners of the fantastic prizes!!! .... will be announced later this week. I cheated a bit and ran our one mile race this morning. 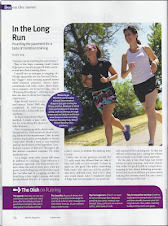 I couldn't really fit it in with my marathon training this week and all of the craziness life has thrown at us lately. Little Dude and Little Diva fueling up with bananas. Little Dudes can wear Bondi Bands, too! She said, "Mommy, I'm feelin' good!" I followed our one mile run with a 5K on the treadmill, with both of them playing along side me. Daddy was out on a 3 hour bike ride, training for his upcoming 1/2 Ironman. We spent 8 hours by the pool and sprinkler. I have a bit of a sunburn (they do not!). Little Dude went in the potty today. Thank you everyone for your wonderful, supportive comments regarding what life has thrown at us lately. Things were looking up today and hubby has several interviews and second interviewes lined up this week. We are hopeful. In the meantime, I'm enjoying getting outside with the kids and the extra free time I have with them, while tapering this week. 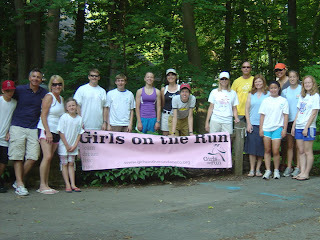 Read more about Girls on the Run HERE. Visit my Sole Mates donation page HERE. 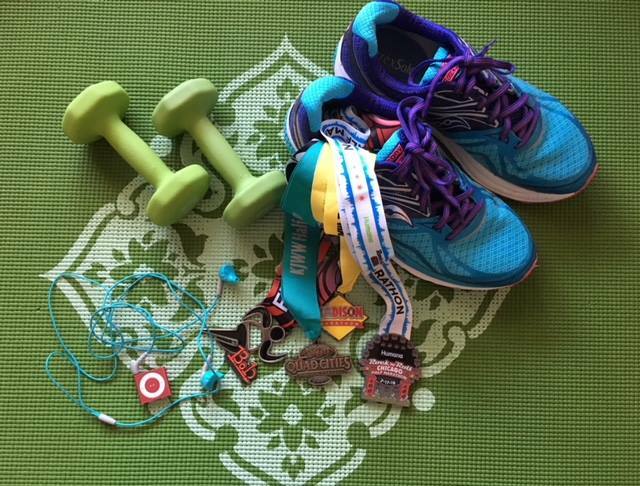 12 mile Trail Run with Hubby & a Giveaway!! Wacky Weekend ... Happy Mother's Day to Me!! 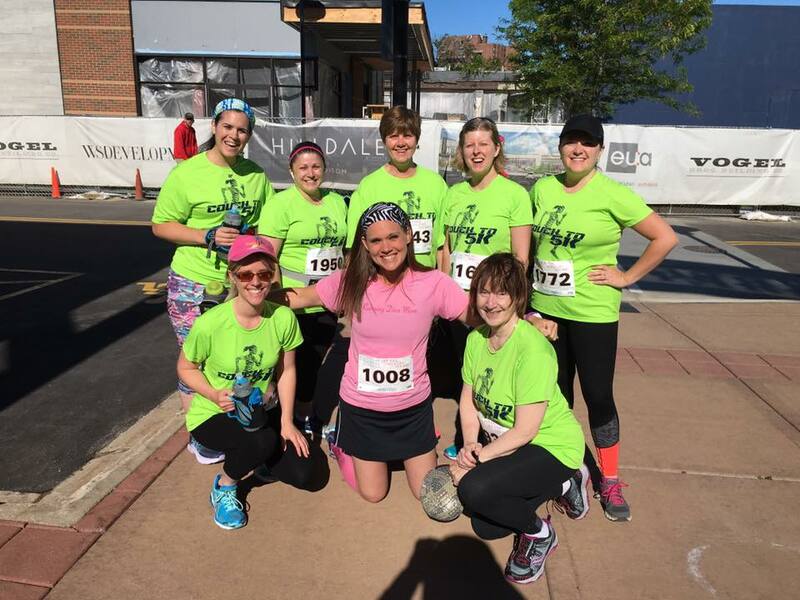 Thank you for voting for Girls on the Run!